The Garadget is cloud-based device that "futurizes" your existing garage door opener, letting you open and close your garage door from anywhere, including via openHAB with this binding. Remote access is made possible with the particle.io REST API. This binding can be configured in the file services/garadget.cfg. The syntax for the Garadget binding configuration string is explained below. Garadget bindings start with a < or >, to indicate if the item receives values from the API (in binding) or sends values to the API (out binding), respectively. A single garadget= binding string can contain multiple in and out bindings separated by commas, so that a single openHAB item can be used to send commands to your Garadget device(s) as well as receive state updates. The Garadget binding suppresses auto-updates of items that are sent commands, so that the actual state reported back from Garadget is used. See the doorState example item below. Where <device> is a device identifier and <property> is either a device field or variable (in binding) or function (out binding). Where can I find my device identifier? A device identifier is a long decimal number. One way to find the number is to login to garag.io and read the URL you were taken to in the browser's address bar: http://garag.io/my/settings.php?id=270041234567343432313031 The final component of the URL is your device identifier. Here are some examples of valid binding configuration strings, as you would define in your .items file. Change the device identifiers below to match your Garadget(s). 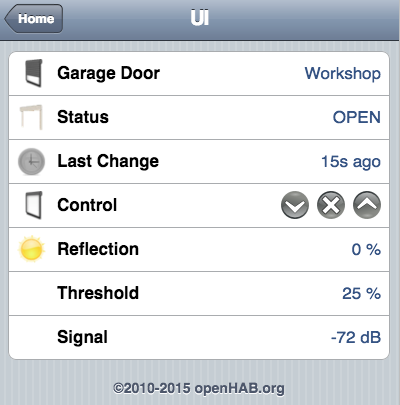 // Send the doorState item commands like ZERO, HUNDRED, UP, DOWN, ON, OFF, STOP, or "open", "closed" or "stop". // send the setConfig item commands like "ans=1200|ane=420" to set night time alert to 8pm-7am, for example.